In connection with the tenth anniversary of the attacks on New York City and Washington DC, the Smithsonian Museum of American History put together an exhibit commemorating that history-changing day. My wife and I stood in line for 90 minutes to enter the small room, which contained four tables of artifacts, one each for New York, Washington, Pennsylvania and the Transportation Security Administration. Yes, the last one seemed oddly lacking the parallelism of the first three. 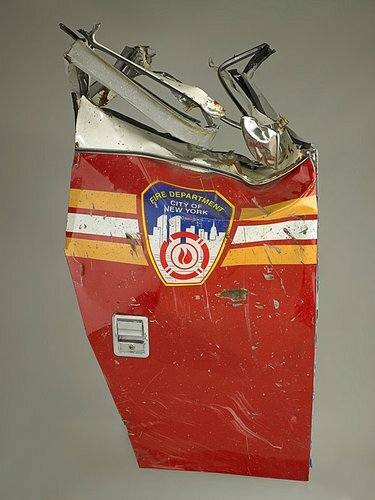 Firefighters’ equipment, a beeper, survivors’ photograph from the stairwell, an ID tag, a firetruck door twisted by heat and , a uniform were among the items I vaguely remember displayed. More clear was the reverent, bordering-on-sacred hushed tones from the long line of people slowly winding their way around the room. We were told of the uniqueness of these displays, on tables with no glass between the viewer and the artifact. Yet, the most memorable display was a television set, re-running the morning’s news clips, starting with the pointless chatter of Michael Jordan’s comeback to the NBA and winding through to the almost off-handed announcement of a plane crashing into the World Trade Center all the way through the lead anchors getting to the station and taking over the non-stop news through the rest of the day. This television reel portrayed better than any artifact on the tables our journey that day, passing from our innocence to the emergence of a changed world. It was certainly more emotional, more riveting. We wanted to hit the pause button and reclaim that lost epoch; we wanted the rest of Good Morning America to continue as planned, with stories about new diets or small-town oddities. What brought this to mind now, six months later, was a recent re-playing on National Geographic of “The Lost JFK Tapes.” Re-watching the motorcade winding its way through Dallas, with Jackie and JFK transported me back to the nine year-old riveted to the television that fall weekend, wishing that the motorcade would make its way to the luncheon where he was to speak before the assembled business elite of Dallas. It reminded me of my visit last month to Atlanta and the Martin Luther King National Historic Site. The humble wagon which carried King’s casket through Atlanta, the pictures of his childhood, the civil rights walk of fame, the Ebenezer Baptist Church all paled in contrast to two videos – his Dream speech in Washington DC and, especially, his Promised Land speech the night before he died, where he predicted his end. Do other film moments evoke such instant, emotive history? Perhaps the Challenger liftoff or the first moon landing. Certainly the tsunami disasters are best portrayed by video. And, what does this mean for museums, seeking to tell a story, if visitors could just as easily have stayed at home and watched the moment from their living room flat screen or laptop or mobile phone? Or for historians trying to write the story when the video allows the viewer to see for themselves, not through the words of an interpreter? This entry was posted on March 10, 2012, 11:51 pm and is filed under History in our surroundings, Personal memory, Public Affairs. You can follow any responses to this entry through RSS 2.0. You can leave a response, or trackback from your own site.